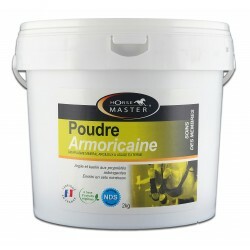 The original poultice of clay, kaolin and minerals for use on the horses legs. POUDRE ARMORICAINE is ideal to use after hard work or as a weekly routine application. POUDRE ARMORICAINE provides fast relief in reducing inflammation, muscular soreness on legs. Mix two parts powder to one part water.